Floyd Mayweather’s next fight–presumably against Marcos Maidana–might happen in New York City in a few months. According to the New York Daily News, Mayweather also got a license in New York to promote, suggesting that he might be aiming to fight there. A spokesperson with the state commission to the paper that Mayweather Promotions “has now been licensed.” No date was given, and no other details were revealed. The fight could happen at the Barclays Center in Brooklyn. Its CEO, Brett Yormark, said he was encouraged by the move. But the Daily News quoted another promoter, Lou DiBella, as saying that Mayweather is probably trying to promote his own fighters rather than himself in New York. For Maidana’s part, his manager hasn’t said anything. “REMATCH in the talks. Respect for @FloydMayweather man of his word, yet only fist talk in the ring. #LATINPOWER,” Maidana wrote on Twitter. Mayweather’s first fight with Maidana only resulted in around 850,000 Pay-Per-View buys, which is lower than average for a Mayweather fight. In comparison, Mayweather’s bout versus Canelo Alvarez did 2.2 million buys. 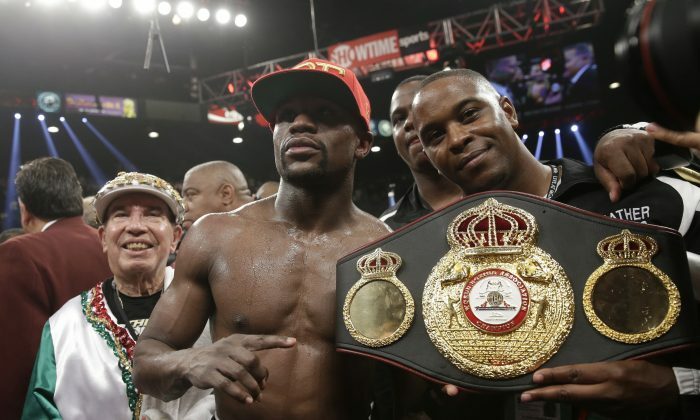 Mayweather Promotions CEO Leonard Ellerbe said his team was fine with the numbers.